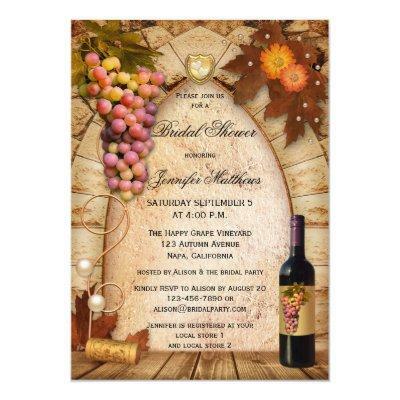 A beautiful traditional bridal shower invitation featuring an Italian style painting with a Roman arch, grapes, fall leaves and flowers and a bottle of wine on rustic wood. You can customize, drag, rotate or delete text fields, as well as change fonts and more. For all options, choose "customize it" or "personalize". Beautiful for a celebration in a wine bar, winery or vineyard.